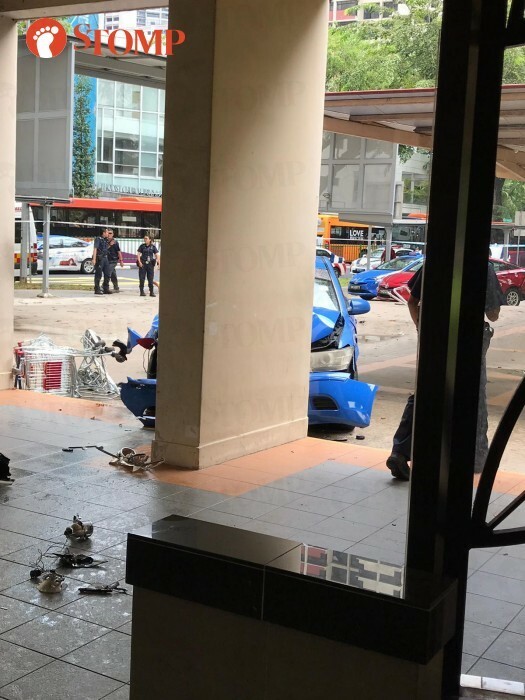 A 62-year-old cabby was taken to hospital after an accident involving two taxis occurred along Toa Payoh Central on Monday afternoon (April 1). Stomp understands that the accident happened at a taxi stand along a service road. A Stomper, who passed by the scene at around 1.40pm, contributed photos showing a ComfortDelGro taxi at the foot of Block 175 in Toa Payoh. Stomper Philip also shared pictures showing the ComfortDelGro taxi with its front bumper mangled. A slanted signpost and overturned supermarket trolleys can also be spotted at the scene. Responding to a Stomp query, the police said it was alerted to the accident at 12.14pm. The ComfortDelGro taxi driver was conscious when taken to Tan Tock Seng Hospital. Ms Tammy Tan, group chief corporate communications officer for ComfortDelGro, told Stomp: "We are relieved that no passengers were on board our taxi and no members of the public were injured as a result of the incident. "Our loss adjustors were immediately activated and will be in touch with the relevant parties to assist the best we can." ComfortDelGro is also in touch with its cabby, who has been hospitalised, and will assist the police in their investigations, added Ms Tan.